ItemsSource refers to a collection of data that we’ll be listing in the ListView. We’ll come back to this but notice that the ItemsSource is bound to a property (in this case a collection) in the BindingContext. Vertical Options is set to FillAndExpand. This is one of an enumerated list of VerticalOptions. FillAndExpand makes sense on a StackLayout but is identical to Fill in an individual element. In either case, here FillAndExpand means to provide enough room for the element vertically. HasUnevenRows is a critical property – it means that the data will be displayed in such a way that some rows will be larger than others. Over time, we’ll come back to this one, but failing to set this can cause your list not to appear at all. Within the stacklayout (and thus within every cell for each item in the list) are two labels, the first bound to the Text property, and the second bound to the Description label. Finally, the Style refers to XAML styling, a topic that will receive a post of its own. Let’s return to the top of the ListView where we found the ItemsSource was bound to a property Items. Once again, we’ll come back to an ObservableRangeCollection, but for now it is a type of ObservableCollection; that is a collection that raises an event when an object is added to or removed from the collection. The part we care about here is that, sure enough, the Item class has a property Text and a property Description, which are the properties the two labels bind to. There is much more detail to dive into, but you’ve seen the essentials of using a ListView in Xamarin.Forms. More detail to come in upcoming posts. 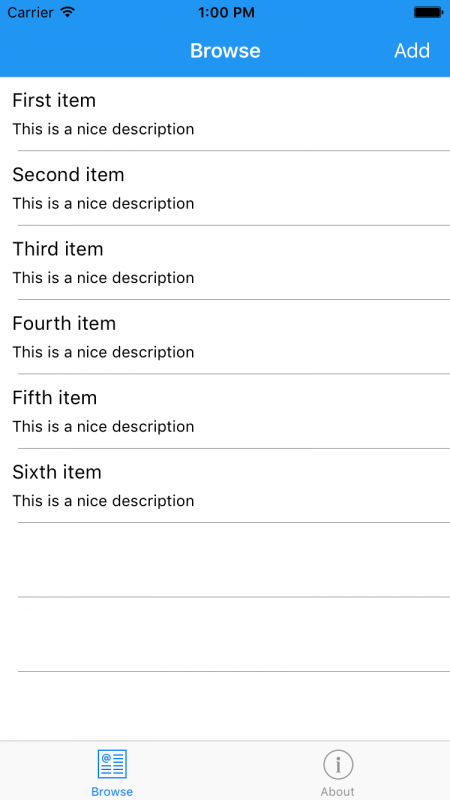 This entry was posted in Essentials, Xamarin, XAML and tagged Xamarin, Xamarin.Forms. Bookmark the permalink.